Jackson City Hall is located at 219 South President Street, Jackson, MS 39205; phone: 601-960-1084. Photo: Old Capitol Building, Jackson Mississippi, photographed by Michlaovic, 2009, en.wikipedia.org, accessed February, 2011. Spreading along a high bluff with the Pearl River forming its eastern boundary, Jackson is Mississippi's largest city and its capital. Founded and platted as the seat of government, and for 116 years the funnel through which all the turbulent events of the State's history have poured, Jackson has a background which is, in turn, murky with political intrigues and bright with historic associations. Its position as the democratic heart of the State accounts for its tone and prestige; the skyscrapers spaced along Capitol Street and the new outlying subdivisions are evidences of its rapid expansion on the surge of an industrial and governmental boom. For Jackson is the crossroads to which all Mississippians gravitate; and in a State that is predominantly rural, it alone has the metropolitan touch. Jackson had its beginning as Le Fleur's Bluff, the trading post of Louis Le Fleur, adventurous French-Canadian who had his cabin at what is now the intersection of South State and Silas Brown Streets. When the Treaty of Doak's Stand expanded Mississippi by breaking the bounds of the Natchez District in 1820, the legislature decided that the capital city should be located near the center of the State rather than at Columbia or Washington. From Columbia, the temporary capital, a three-member commission composed of General Thomas Hinds, hero of Andrew Jackson's coast campaign against the British, William Lattimore, and James Patton made their way up the Pearl River to select a suitable location. Le Fleur's Bluff, with its extensive fertile flat to the east and rich prairie to the west, plus its strategic location with regard to river transportation, was the commission's choice. In 1821, three days after Thanksgiving, the legislature appointed Peter Van Dorn to work with Hinds and Lattimore in laying out the city, assisted by Abraham DeFrance, superintendent of public buildings at Washington, D. C.
The first state house was completed in 1821. It was a two-story building with outside dimensions of 30 by 40 feet, and was constructed of brick, clay, and limestone found in the vicinity. Shutters on each window, upstairs and down, added the 19th century modern touch, and large chimneys flanked each end. The first session of the legislature convened here in January 1822. The name of the newly created city was changed to Jackson in honor of Andrew Jackson, then the idol of Mississippi and later President of the United States. The area around the city became Hinds County, named for the chief of the capital commission who had been Old Hickory's associate in military campaigns in the South. The new state house was erected at the approximate center of the town site, which embraced two adjoining half sections of land deeded for the purpose, and which had been laid out on the checkerboard plan in accordance with Thomas Jefferson's suggestion to Territorial Governor Claiborne 17 years before. Each square designated for building purposes was alternated with a square reserved as a park or green. Evidence of this plan remains in downtown Jackson and on College Green, which extends east of the New Capitol. The original boundaries were the bluffs on the east, and South, West, and High Streets, the town including College Green, Court Green, and Capitol Green. Among the first settlers was Lieutenant Governor Dickson, who was appointed postmaster soon after his arrival. In 1823, 100 lots were offered for sale. Records of early Jackson were burned during the War between the States, but it is known that there was agitation for removal of the state house. In 1829 the Senate passed a bill authorizing the removal to Clinton, but the measure was defeated by a tie vote in the House. In the next year the House voted 18 to 17 to move the capital to Port Gibson, but immediately reconsidered. The following day they voted 20 to 16 to move it to Vyksburg, but still no action was taken. 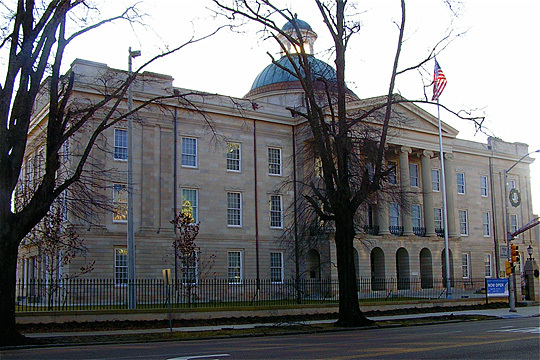 Then, to avoid the question for a number of years, the constitution of 1832 designated Jackson as the capital until 1850, when the legislature should name a permanent seat of government. By 1850 Jackson was well established and the legislature made no change. Federal Writers' Project, Works Progress Administration, Mississippi: A Guide to the Magnolia State, The Viking Press, New York, 1938.